The models featured on The Brothers Brick are here because we think they’re cool, but most of them share one thing in common, they make use of advanced building techniques. 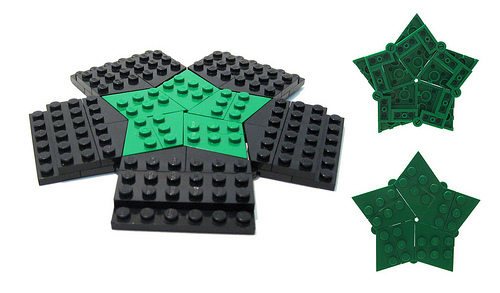 These techniques range from Studs Not On Top (SNOT) building to strange parts use and connections, or as the star above demonstrates, making use of part geometry to achieve something interesting. While nothing can beat practise and experiment for learning about these techniques there are a few useful guides and the likes out there to help you along the way. I’ve collated a list of some links for those who want to improve their building technique or who are just curious. Perusing any of these should prove illuminating and help hone your building techniques. Of course there are plenty more out there so if you know of any then please post a link and description in the comments section. There are a lot of the things I have learned from this site and its links but all gathered together. Huzzah for convenience! I’m sorry, the editor in me will not let that fly. As always great stuff on this site! Inspiration and technical references all in one place. I appreciate the visual eye candy that challenges the builder in me to come up with things. I had been noticing the SNOT images for about 6 months and recently got a pick-a-brick box via the promotion and built a crystal footbridge with control room all SNOT style. The challenge is much greater than I anticipated. Thanks for being you, BB. Thinking about making a building like this? I would love to see posts like this as a semi-regular feature on The Brothers Brick. The few primers on SNOT techniques and brick ratios I came across when I discovered the online community were invaluable. This is just the blog that my 12 yr old son and I need. I’m always inspired by the awesome builds like the guy who did the doll from ghost in the shell. But, then failure and defeat set in when I try to build because of lacking required skills and technique. It’s great to have online resources, kind of like online education for lego building. You guys may never have claimed to be perfect, but as of now, we do.